The pre-credits sequence of Werner Herzog’s Aguirre, The Wrath of God informs us that the film is based on the journals of the monk Gaspar de Carvajal, who accompanied the 16th century expeditionary forces of Spain’s Gonzalo Pizarro. This announcement proves to be about as truthful as the claim of authenticity that kicks off the Coen brothers’ masterful Fargo, or those same filmmakers’ insistence that O Brother, Where Art Thou? owes its allegiance to Homer; which is to say Herzog’s claim is an amusing bit of auterist fabrication which reminds us that, for all its attempts to recreate historical reality, Aguirre is a movie, filtered through the perceptions and preconceptions of one man. And what a man this is. As Outlaw Vern might note, one masterful filmatist; to the rest of us, one Werner Herzog. Once one moves beyond this opening bit of posturing, it is tempting to assert that Herzog’s theses in Aguirre are completely realized in the film’s opening and closing scenes. Of course, to do so would be to underestimate the power, magnificence and importance of the film’s intervening 90 minutes, but still, the temptation remains. As I am, like Oscar Wilde, able to resist everything except temptation, why not explore it? The film’s rightfully famous opening shot, with the camera mounted at a discreet distance, gives us a stunning image of an Andean mountain through a hazy mist, and is followed quickly by a stately zoom in that appears to show us a trail of ant-like creatures working their way down the mountain. As we get closer, it is revealed that these are not ants, but men, conquistadores, in fact, in full military regalia, winding their way down a rugged path, to the accompaniment of Florian Fricke’s ethereal and haunting score. The men move down, down, down, through the clouds, but paradoxically remain in a fog throughout. Most of the laborious carting of materials appears to be done by both llamas and natives, some (most? all? this is unclear) of whom are chained together, while the conquistadores carry only their armor and weaponry. It is entirely appropriate that all that these men bring to this wilderness are instruments of death and destruction. Early on, a cage crashes down the mountainside, its contents splattered against the unforgiving rocks. Later, a cannon also falls to its doom, exploding in a fireball at the mountain’s base. The jungle looks on impassively, absorbing the relics of human refuse as if we were infinitesimal fossils trapped between layers of Cambrian rock. And the men march on. Trailing the expedition is the man we will come to recognize as the film’s titular character, played with typical gusto by the irrepressible Klaus Kinski. Holding onto the delicate hand of a young lady we later learn is his daughter, Flores (Cecilia Rivera), Aguirre guides the fair maiden through the wilderness. Does she symbolize the expedition’s dreams of bringing all that is great about European culture—beauty, purity, religious faith—to the jungle? Or is she inserted by Herzog as an offering to the pagan gods for a golden harvest? It’s hard not to be affected by Aguirre’s obvious adoration of his daughter; that is, until in his madness he also talks of marrying her. Five minutes pass, and no one has spoken, and when the men finally reach the river, Herzog’s first shots are of a brood of young swine drinking deeply. Does this really require interpretation? And what to make of the film’s final moments? The expedition now clearly doomed, Herzog’s camera circles the raft in ever-shrinking concentric circles. Like a cubist painting, which shows us all sides at once, Herzog presents the remnants of the expedition from every conceivable angle, so there can be no hiding, and no doubt about what has become of this once apparently magnificent array of humanity. All but Aguirre are dead. Like murder victims trapped in an Agatha Christie plot, they have fallen in eerie succession to invisible executioners. These men, while certainly in it, are not creatures of this world. They stuck out like Courtney Love at a Lilith Fair concert. And in a bit of genius, Herzog replaces Aguirre’s crew of men with monkeys. So reminiscent of the army of hideous rats that swarm the vampire’s ship in Herzog’s 1979 remake of Nosferatu, the monkeys serve also as a warning, almost comically delivered by Aguirre in a moment reminiscent of Hamlet holding Yorick’s skull aloft: From whence we came, so soon we will return. A film that has a lot to say about the destructive forces wrought upon mankind and nature by people who choose to impose their lunatic visions upon us, Aguirre, The Wrath of God is both anthropologically and historically allegorical, as the many fantastical and unattainable quests of man to achieve immortality through fame and wealth inevitably lead to Ozymandian dust. The moment in mid-film when one of the rafts is caught in a whirlpool straight out of Homer’s Odyssey, Herzog’s philosophy goes to work. These men’s attempts to find the mythical land of El Dorado, to become medieval alchemists and establish a golden kingdom here on Earth, is a the sort of tail chasing effort that is forever doomed to failure. However, Aguirre is not merely a curious historical anecdote; the film is just as clearly referencing the here and now, as while Herzog filmed his masterpiece in the jungles of the Amazon, there was another war raging in the jungles of Southeast Asia that was heading in a similarly dismal direction. Further, it is clear that there remain men hungry for power and glory in the world today who lead us into doomed quests and futile conflicts. Despite his respect for the power and indomitabilty of nature, Herzog is not a late 20th century hippie, but a 19th century romantic; nature reminds us of the transience of human endeavor, and the futility of searching for permanence in a world where all things must return to dust. Ultimately, Herzog argues, the colonist gets reabsorbed into the colony, the oppressor swallowed up by the object of his oppression. The madness of Aguirre—his belief that he is God’s instrument of vengeance—has both precedence and modern relevance. I certainly do not mean to devalue the rest of the film, which is brilliant and horrifying, and never less than thoroughly captivating. I could not for a second imagine this world without Kinski’s arachnid-fueled performance, or Thomas Mauch’s striking cinematography, not to mention the shots of the men on the rafts wandering aimlessly down the river, with the jungle staring them down like a vengeful god. Nor would I want to forget the tableau of the mock coronation of Don Fernando de Guzman or the subsequent shots of his gradual degradation, as he sinks deeper and deeper into his appetites; the disappearance of the golden-garbed princess, one stately and dignified step after another into the apparently inchoate wilderness; the symbolically-freighted death of Aguirre’s virginal (sacrificial?) daughter, and of course, that damned boat, sitting atop that bloody tree. Has there ever been a better metaphor for hubris and the pointlessness of so much human endeavor? Aguirre was my first cinematic experience with a Conrad-ian journey into this heart of darkness, and it remains my favourite. Ben Livant astutely identified Herzog’s later foray into the Amazon, Fitzcarraldo, as a footnote to the grand text that is Aguirre. I would go a step further to suggest that Coppola’s own jungle initiative, Apocalypse Now, and much of the oeuvre of Terrence Malick, are also footnotes—however grand, impressive and flawed they may be—to Herzog’s seminal work. Aguirre, The Wrath of God went there first, did it better. Herzog’s film does not merely stand the test of time, it both inhabits and transcends time (not to mention place), in ways that only the truly great films, like Dreyer’s The Passion of Joan of Arc, Kubrick’s 2001 and Tarkovsky’s Andrei Rublev, ever do. It is ironic that a film that decries man’s attempts to achieve immortality should be timeless. Dan Jardine is a contributor to The House Next Door, the publisher of Cinemania, and a contributor to Cinemarati. 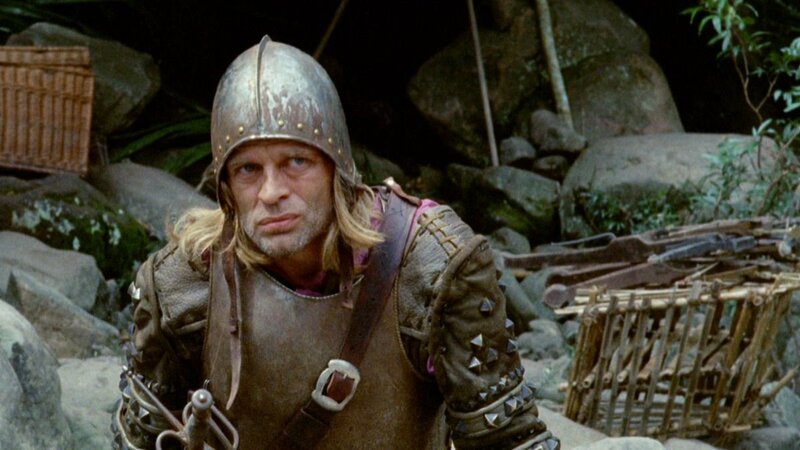 Aguirre, The Wrath of God plays Oct. 20-25 and Oct. 30-31 at Film Forum in New York City.